Firestopping non-dampered heating, ventilation, and air-conditioning (HVAC) duct penetrations in fire-rated walls is more involved than installing that ubiquitous red caulk into the space between the duct and the periphery of the opening. Because of the nature of thin sheet metal ductwork and the physics that come into play during the course of a fire, additional steps are required to ensure that such penetrants are properly protected. A cursory review of the UL Fire Resistance Directory, Volume 2 at the start of this decade would have shown 66 systems for HVAC ducts passing through walls. Today, a search would yield 237 total systems for HVAC duct penetrations through walls. In just 7 years, the industry has more than 3.5 times more designs representing advances in firestopping technology for a fairly common type of penetrating item. Many HVAC ducts penetrating fire-rated walls are externally insulated with light-density glass fiber duct wrap, whether for energy conservation, efficiency increases, condensation control, or even sound attenuation. The average insulation contractor may be faced with situations where he or she needs to firestop HVAC duct penetrations through fire-rated walls. Additionally, many insulation contractors provide integrated firestop installation as a service. Knowledge of how to properly firestop HVAC ducts can go a long way toward making jobs run smoothly, minimizing costly delays, and increasing profitability. Although there are a variety of different materials used to fabricate HVAC ducts—such as insulated panels, fiberglass reinforced plastic (FRP), aluminum sheet stock, or different grades of steel—sheet metal ducts fabricated from steel sheet stock are the most popular type of HVAC duct used in commercial construction. This is good from a fire-resistance perspective, as steel is inherently fire resistant. Ductwork fabricated from some of the alternate materials listed above can burn through, collapse, or melt, propagating fire through walls. It does not stop there, however. Fabricating the duct from steel sheet stock does not mean it will be easy to firestop. Solids (for the most part) expand when heated and contract when cooled. Sheet metal expands dramatically when heated under fire conditions, which can have a profound impact on the performance of the firestop system. 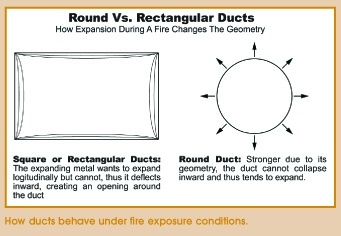 Square or rectangular ducts can deflect or distort when exposed to fire. This can cause gaps or voids to develop within a firestop system, allowing fire and smoke to pass through unchecked. Round ducts are stronger, due to their geometry, and will not collapse inward. Given the propensity of square and rectangular ducts to deflect, distort, or collapse because of thermal expansion of the metal under fire conditions, virtually all designs require the use of steel retaining angles to prevent deflection. These L-shaped steel angles are cut to the length and width of the duct and attached by means of steel fasteners or welds to the flat sides of the duct. Some duct designs for smaller square or rectangular ducts may list the retaining angles as being optional. Such designs typically feature the use of an intumescent firestop product that will expand when heated to fill the voids as the duct sides deflect slightly. On larger ducts, even the most aggressive intumescent firestop products are incapable of completely filling the gaps that result from deflection of the metal if retaining angles are not used. Deflection will not be as great on a shorter span. Since round HVAC ducts do not deflect, they are relatively easy to firestop. They can simply be sealed with a firestop caulk, such as an all-purpose intumescent firestop sealant. Firestopping square or rectangular non-dampered HVAC ducts is typically more involved. Generally, the first step is to pack the opening with forming material such as glass fiber, backer rod, or mineral wool. Some designs use mineral wool because its high-temperature capabilities give it the capacity to contribute a degree of fire resistance when installed in conjunction with firestop sealant. Other designs may use foam backer rod or glass fiber as a form to facilitate installation of the sealant along a long span. The next step is to install firestop sealant to the appropriate depth. The final step is to install the retaining angles to the flat sides of the duct. Although the user should consult the individual Underwriters Laboratories Inc. (UL) design, as a general rule the retaining angles should be sized so that they lap 2 inches onto the duct and 1 inch beyond the periphery of the opening. So if the space between the duct and the opening is 1 inch, a 2- x 2-inch angle would be required. In walls, the forming material, firestop sealant, and steel retaining angles are installed symmetrically on both sides of the wall. It seems straightforward enough, but it is not typically a step-by-step process. The installation of the steel angles covers the opening, including the firestop sealant, commonly colored red for easy identification. This can interfere with the process of inspection. Therefore, in many jurisdictions, inspection is a two-stage process. The first stage is to inspect the installation of the firestopping materials installed into the opening, and the second stage is to inspect after installation of the steel retaining angles. This more drawn-out inspection process can have a tendency to cause schedule delays. Many ducts contain fire and/or smoke dampers that are designed to activate under fire conditions and seal off the path of fire and/or smoke internally within the duct. On many projects, there are questions about how to properly firestop ducts containing dampers where they breach fire-rated walls. This is a highly controversial topic. Some dampers require a specific clearance between the damper and the periphery of the opening to allow for expansion and contraction of the metal under normal operating conditions. In other cases, damper manufacturers contend that installing materials (such as compressed insulation) into this space can interfere with the action of the damper. There are many other concerns that need to be addressed when it comes to ducts containing dampers. Rather than trying to address all of those concerns, it’s best to contact the manufacturer of the damper for guidance when ducts containing fire and/or smoke dampers are encountered. Going back to the 2000 UL Fire Resistance Directory reveals just four designs for ducts insulated with light-density glass fiber duct wrap. Many additional designs are now available to cover various other permutations where steel ducts are insulated with light-density glass fiber duct wrap. Insulated steel ducts present a bit more of a challenge because the glass fiber begins to melt at about 1,200°F, a temperature reached within the first 10 minutes of a fire test. Also, because of the fluffy nature of light-density duct wrap, the firestopping material sometimes needs to be able to expand to fill a fairly large space. Some designs that use an intumescent firestop sealant or wrap strip alone, without the need for steel retaining angles, have been developed. However, when the duct size increases substantially, steel angles are a definite requirement. There are two ways to firestop ducts insulated with glass fiber duct wrap when steel retaining angles will be used. The first method is a bit contentious among insulation contractors, manufacturers, and engineers. It is to install the firestopping materials into the space between the insulated steel duct and the periphery of the opening in the normal fashion, followed by installation of the steel angles directly to the steel duct. This is accommodated by slitting the insulation to permit the steel angle to attach to the duct. Some argue that this is a situation ripe for creating condensation problems. The preferred method in many cases is to not breach the vapor barrier by installing the steel angles directly over the duct wrap, compressing the duct wrap during installation. However, it is important to verify that a UL system allows for the particular configuration of the steel retaining angles. Some HVAC ducts are being protected with proprietary high-temperature duct wraps to resist the spread of fire from compartment to compartment without the aid of fire dampers. These systems address insulation, integrity, and stability of the system, and they even have their own category in both the UL Directory and the Intertek/OPL Directory. Unless otherwise specified by the design, steel retaining angles are not required, even on the largest of such ducts. Where these ventilation ducts pass through fire-rated assemblies, openings such as these are firestopped. Designs exist in both the UL Directory and the Intertek/OPL Directory that show how to properly firestop such systems. In many cases, a firestop system will consist of caulk and a backing material, or of caulk alone. The evolution of firestopping has led to significant improvements over traditional methods. Continuing training and educational efforts are leading to a heightened awareness of the importance of proper firestopping and its impact on improving both safety and property protection. Authorities are now well versed in the requirements for proper firestopping. They are also trained to understand how penetrants and materials react together. This knowledge helps in the proper selection and installation of firestopping systems for HVAC ducts, as well as other types of applications. The UL Fire Resistance Directory, Volume 2, as well as the free online searchable database at www.ul.com, are great sources for information on firestopping. Also, many of the larger firestopping manufacturers have highly qualified technical personnel who can explain the subtle nuances of firestopping, as well as skilled field personnel who can conduct more specific training.